Third-world despots like Israel’s Netanyahu murder journalists in broad daylight. 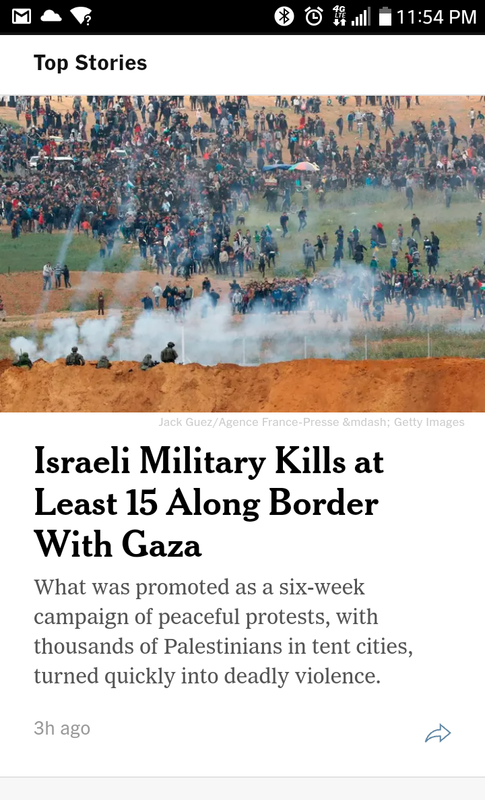 Worse, more than 30 Palestinians dead and more than 1,000 injured by IDF shooting into crowds & other means since Gaza border mostly nonviolent protests began about one week ago. Netanyahu, The Butcher of Gaza, more than once has led apartheid Israel here to the depths of a depravity rarely witnessed by a modern industrial society. Israeli military shot 6 clearly marked journalists on Friday, killing one, Yasser Murtaja, 31, of Ain Media who was shot in lower abdomen. 6 clearly marked journalists shot by Israeli snipers yesterday while these men covered the Palestinian “Day of Tires” protests. No justification, ever, for intentionally targeting the press. More war crimes by Israel. NY Times was one of very few publications to use a simple declarative headline for what actually happened. Yasser Murtaja, 31, of Ain Media shot dead by IDF snipers as he recorded Day of Tyre protests. Image from NY Times.